The Bible describes Hell or the place of final punishment with terms like “eternal punishment,” “unquenchable fire,” “death,” “destruction,” “Gehenna” and “lake of fire.” A key question in the debate is whether this language describes eternal torment. When debating this question traditionalists sometimes claim that it is simply not possible to express the doctrine of eternal torment any clearer than the biblical authors do. After J. I. Packer in Hell Under Fire discusses the biblical material and concludes that it teaches eternal torment, he asks this question: “How could our Lord and his apostles have made this belief any clearer? What more could they have said that they did not say had they wanted to put everyone out of doubt that this was indeed their meaning?” (Loc 4425). I take Packer’s and Zuber’s questions to be rhetorical. The claim that lays behind the question is straightforward: not only does the Bible teach eternal torment, the biblical authors could not have been clearer in their affirmation of the doctrine. What is the significance of this claim? Let me be clear: I don’t think the traditionalist’s case depends on whether we can think of any way in which the Bible could have more clearly communicated eternal torment. 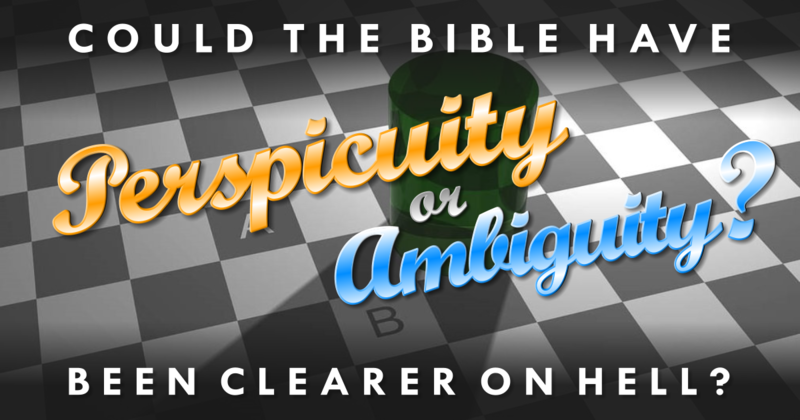 The question of to what degree of clarity the Bible teaches that doctrine will not settle the debate. Still, the issue of degree of clarity is significant. Why? Let’s assume that Packer and Zuber are right in their assertion—it is not possible to express the doctrine of eternal torment with greater clarity than what we see done in the Bible. This would strengthen the case for traditionalism. The only thing left for the traditionalist to do would be to point to any apparent ambiguity in the passages that conditionalists or universalists use to argue for their view, and the traditionalist would be seen to have the stronger biblical case. Now, let’s assume that Packer and Zuber are wrong in their assertion—it is possible to express the doctrine of eternal torment with greater clarity than what we see done in the Bible. This would weaken the case for traditionalism, since the traditionalist now has to answer the following question: Why didn’t the Bible express the doctrine of eternal torment with greater clarity if it was possible? I see two possible explanations: either the biblical authors had reasons to muddy the waters—but what reasons?—or, alternatively, the the Bible actually does not teach eternal torment after all. How can we evaluate Packer’s and Zuber’s claim? One method is to compare the biblical material with alternative texts exploring the same topic. It is largely undisputed that the Qur’an also teaches eternal torment, and as it turns out the book contains a true wealth of verses on the topic. For this reason the Qur’an is fit to serve as a comparative reference. For the sake of simplicity, I will not be looking at the doctrine as a whole. Instead I will limit the comparison between the Bible and the Qur’an to three statements which I take to be essential to the doctrine of eternal torment. These statements are not to be understood as a definition of the doctrine, but I take them to be central parts of it. Due to the overwhelming material on the topic in both the Bible and the Qur’an I will only be able to take a cursory look at the verses covering the topic in question. Still, even a somewhat superficial comparison will serve the purpose of evaluating Packer’s and Zuber’s claim that the Bible could not have been clearer in communicating the doctrine of eternal torment. The three statements taken to be central to the doctrine in view are: 1) The lost are in some sense alive for all eternity, unable to escape conscious existence; 2) Hell is an actual place where the lost will exist forever; 3) Pain is a central part of the punishment in Hell, consciously experienced for all eternity. For each statement I will examine first the biblical and then the qur’anic material. 1) The lost are in some sense alive for all eternity unable to escape conscious existence. The Bible says that death is the penalty for sin (Romans 6:24). This is in line with the warning received by Adam: “When you eat from it [the tree] you will certainly die” (Genesis 2:17). When the penalty is later repeated it becomes clear that physical death is what is in view, not a conscious existence in a state of ”spiritual death”: “You [will] return to the ground, since from it you were taken; for dust you are and to dust you will return” (3:19). Throughout the Old Testament God acts in a similar way in wiping out all life on earth during the flood (6:7) and destroying Sodom and Gomorra by the fire from heaven (19:24-28). In both instances the penalty for sin was the ending of life, and both instances were made examples “of what is going to happen to the ungodly” (2. Peter 2:5-6). In Jesus’ teaching and atoning death we see the same pattern. Repeatedly Jesus contrasts the fate of the lost with life, plain and simple (John 3:16). He does not give us a contrast based on quality of conscious existence (one being painful, the other blissful). Jesus says that hell is the prospect of God destroying both body and soul (Matt 10:28), eliminating the possibility of ‘death’ being some kind of eternal existence experienced by the soul. Jesus himself died on the cross for our sins, but obviously wasn’t endlessly tortured, and so he underwent the same penalty for sin: He lost his life. Some descriptions of hell are said to imply conscious existence such as the unquenchable fire and undying worm in Mark 9:48. But here Jesus is quoting Isaiah 66:24, from which we learn that senseless corpses are what is in view. “Eternal punishment” in Matthew 25:46 is likewise claimed to imply conscious existence, but this is only the case if the concept of eternal torment is read into that phrase (after all, annihilation is also an eternal punishment). In 2 Thessalonians 1:9 the unbelievers are said to be suffering “everlasting destruction and shut out from the presence of the Lord.” Exclusion here must entail conscious existence, says the traditionalist. But the NIV is simply adding in the phrase “and shut out,” which is not found in the Greek text. The destruction is actually coming directly from the presence of the Lord. In addition, how can it be possible to sustain conscious existence completely separated from the life-giving God? In Revelation 14:10 the smoke of the torment of the worshippers of the best is said to rise forever. Doesn’t that imply conscience existence? Revelation is full of strong images that are to be interpreted in accordance with the genre, not read as a literal description of reality. The fate of the worshippers in 14:10 is similar to that of Babylon in chapter 18 and 19. But the city will not exist forever, it will be completely destroyed with no trace of life left (18:21-23). Even the Lake of Fire in which the Devil is said to be tormented for all eternity (20:10) is an image later interpreted to mean to die a second time (20:14), meaning “to be no more” (21:4). This interpretation likewise does not support continued conscious existence. Finally, we see in the Bible that immortality is granted to the saved, not the lost (John 6:57 cf. 6:53; Rom 2:7; 2 Tim 1:10; 1 Cor 15:50-55). Such objections made by conditionalists serve to show that the first concept (that the lost are in some sense alive for all eternity unable to escape conscious existence) could certainly be expressed clearer in the Bible. In addition to the word ”abiding,” hell is also called the ”residence,” ”refuge” and ”resting place.” It is quite clear that there is no escape from hell. Once a person is there, he or she will be there forever: “They are never to emerge from the Fire” says 2:167. “We have prepared for the wrongdoers a fire whose walls will surround them. And if they call for relief, they will be relieved with water like murky oil, which scalds [their] faces. Wretched is the drink, and evil is the resting place” (18:29). The Qur’an says that the lost will be in a conscious state of existence somewhere between life and death: “Indeed, whoever comes to his Lord as a criminal—indeed, for him is Hell; he will neither die therein nor live” (20:74). The doctrine of the lost enduring conscious existence is clearly expressed in several other verses such as 43:77 where the lost will call ”Malik,” the ”keeper” of hell: “And they will call, ‘O Malik, let your Lord put an end to us!’ He will say, ‘Indeed, you will remain.’” Escaping conscious existence is simply impossible: “And for those who disbelieve will be the fire of Hell [Death] is not decreed for them so they may die, nor will its torment be lightened for them. Thus do we recompense every ungrateful one” (35:36). The Qur’an affirms the first statement (the lost are in some sense alive for all eternity unable to escape conscious existence) with great clarity and surpasses the Bible on this point. I conclude that the Bible could have been clearer in affirming the first statement. Gehenna is mentioned eleven times in the Gospels. Its origin is the valley of Ben Hinnom, outside of Jerusalem where historically, child sacrifices and idol worship were said to have taken place (Jere7:31; 19:2-6). At the time of Jesus the place had developed into an eschatological illustration for the fate of the lost. Although the valley of Ben Hinnom is an actual place, it is hard to say whether that is the case with the eschatological reality Gehenna points to. It is possible for the whole body to be cast ”into” Gehenna (e.g. Matt 5:30) which would seem to indicate that Gehenna is an actual place. On the other hand, the body’s fate ”in” Gehenna in Matthew 5:30 is parallel to a body part perishing, pointing to Gehenna being a place of destruction, not a place for the lost to consciously exist forever. This is the case in Mark 9:48 where Jesus mentions the worms that do not die and the fire that is not quenched in Gehenna, referencing Isaiah 66:24 where the slain enemies of God lie dead. In Matthew 10:28 Jesus says that Gehenna means the destruction of both body and soul, not ongoing conscious existence. In Revelation 20:15 John sees a lake of fire, a place in which the lost, death and hades are thrown. It would seem odd that the lake would be interpreted as a real place since this would entail the abstract entities, death and hades, existing consciously and even being tormented in the lake. It is far simpler to just follow John’s interpretation of the lake of fire to be a second death (v. 14). Death itself is said not to exist forever in an actual place, but simply to be no more (21:4). The New Testament’s use of Gehenna and the lake of fire points to the fate of the lost being death and destruction rather than a place for the lost to experience eternal conscious existence. Paul’s complete silence on hell being an actual place is further support. In light of these things, the statement hell is an actual place where the lost will exist forever could have been expressed more clearly. The Qur’an speaks of the fire of hell as something that one can be dragged into (44:47) and put into (4:14). This sounds like the language Jesus is using in Matthew 5:29 where it’s said that a body can be ”thrown into Gehenna.” What’s altogether missing in Jesus’ talk about Gehenna is found in abundance in the Qur’an, namely that the lost will stay in hell and experience a conscious existence. In the examination of the qur’anic texts supporting the first statement, I gave several examples of hell being the eternal ”residence,” ”refuge” and ”resting place” for the lost. Once we have established that the Qur’an pictures the lost as consciously existing, the same verses support the notion of hell being an actual place where the lost will exist. Hell has a “lowest depths” where the hypocrites “will be” (4:145). Hell is a ”lodging” prepared by Allah (18:102) and it’s literally described as a ”place” in 11:98 and 15:43. Finally the Qur’an states in simple terms that the fire, hell itself, is the eternal ”home” of the enemies of God: “…the fire. For them is the home of eternity as recompense for what they, of Our verses, were rejecting” (41:28). The Fire is clearly a place for the lost—it will be their ”home” for all eternity. The Fire surely is a permanent place of conscious existence for the lost. I thus come to the same conclusion regarding the second statement (hell is an actual place where the lost will exist forever). The Qur’an affirms it with great clarity and surpasses the Bible on this point. I conclude that the Bible could have been clearer in affirming the second statement. Fire is often used in connection to hell. Fire has at least three functions other than to provide light and warmth: it can consume, it can cause pain, and it can purify. Often it is the pain-causing quality of fire that comes to mind when people think of the fire of hell. This has traditionally been the way the fire of hell has been interpreted and has led to the picture of hell as torment. In the Bible the fire is most often used with reference to its ability to consume. God is called a consuming fire (Deut 4:24, 9:3; Heb 12:29). Fire is used to destroy Sodom and Gomorra (Gen 19:24). In Isaiah 33:14 we read that “the sinners in Zion are terrified; trembling grips the godless: ‘Who of us can dwell with the consuming fire? Who of us can dwell with everlasting burning?’” The answer is obvious. The godless are not able to dwell in the everlasting burning. Far from being the source of pain, this fire is said to consume and do so with such force that the sinner will not be able to dwell there. In Matthew 3:12 the chaff which Jesus will throw into the fire will be burned up. The same idea is in view in Matthew 13:30. Hell will be like a fire completely consuming the lost. Hell is in other words complete destruction. In Gehenna the fire will never be quenched (Mark 9:43.48), says Jesus, quoting Isaiah 66:24 where dead bodies are in view. Neither dead bodies nor chaff can feel any pain, and thus pain is simply not in view here. Instead, consummation and destruction are—bodies and chaff alike are consumed by fire. The only time fire is said to cause pain is in Luke 16, which is set in the intermediate state, not an eternal hell. The only two places where pain is in view when describing what could be considered hell is in the highly symbolic Revelation chapter 14 and 20. What does the image of pain mean in reality? Babylon’s punishment is described in chapter 18 and 19 in similar terms as the lost in chapter 14, yet is ultimately destroyed. In Revelation 20 the Devil, false prophet and the beast are said to be tormented in the lake of fire. The lost, Death and Hades share a similar fate. But how are we to think of death being tormented? We simply acknowledge that the lake and endless torment is what John sees in his vision. That imagery is later interpreted to mean to die a second time (20:4) without any hint of endless torment. So the third statement (pain is a central part of the punishment in Hell, consciously experienced for all eternity) is also in doubt, because that concept could have easily been expressed more clearly. The Qur’an is unmistakably clear in describing hell as a place of intense pain. “The Fire” is used as a synonym for hell and in contrast to the Bible it’s clear that the fire’s ability to cause pain is in view. The lost will burn in hell: “There will be sent upon you a flame of fire and smoke and you will not defend yourself” (55:35). Allah proclaims that “We have prepared for the disbelievers chains and shackles and a blaze” (76:4). The disbeliever will “enter” and “burn” in the hell fire. The fire is “intensely hot” and over the disbelievers “will be fire closed in” (90:20). In hell the disbelievers will be fuel of firewood for the fire: “The Fire, whose fuel is men and stones, [is] prepared for the disbelievers” (2:24). Serving as fuel they will suffer the consequences of the burning fire: “Seared” with the fire “will be their foreheads, their flanks, and their backs” (9:35). Bear in mind, the lost are said to experience conscious existence in hell and thus “[it will be said], ‘This is what you hoarded for yourselves, so taste what you used to hoard’” (9:35). Can “taste” mean anything else than “feel the pain from”? The fire is a literal fire, not only searing body parts but also blackening the faces of the lost: “It will be as if their faces are covered with pieces of the night—so dark [are they] These are the companions of the Fire; they will abide therein eternally” (10:27). The Qur’an is careful to point out that the fire of hell will burn the most sensitive area of the body, the face. The lost will wear “garments of liquid pitch and their faces covered by the Fire” (14:50) and they will not be able to “avert the Fire from their faces or from their backs” (21:39). “The Fire will sear their faces, and they therein will have taut smiles” (23:104) and “their faces will be overturned into the Fire” (27:90). While having their faces “turned about in the Fire” the lost will be able to speak, saying: “How we wish we had obeyed Allah and obeyed the Messenger” (33:66). The lost “are dragged into the Fire on their faces” (54:48) and finally it is said that “We will gather them on the Day of Resurrection, on their faces, blind, dumb, and deaf. Their abode is Hell; whenever it abates, We intensify the blaze for them” (17:97). The purpose of the fire in hell is not to consume but to torment and cause pain. Thus the lost are said to “be tormented over the Fire” (51:13). Unlike Revelation 20:10 where the Devil, the false prophet and the beast are said to suffer unending torment in the lake of fire, the context of 51:13 provides no reason to interpret the verse non-literally. Several other passages emphasize the painful nature of the unending existence in the fire or heat of hell. For instance the disbelievers will “abide eternally in the Fire and are given to drink scalding water that will sever their intestines” (47:15). Similarly it is said that “those who disbelieve will have cut out for them garments of fire. Poured upon their heads will be scalding water by which is melted that within their bellies and [their] skins and for [striking] them are maces of iron. Every time they want to get out of Hellfire from anguish, they will be returned to is, and [it will be said], ‘Taste the punishment of the Burning fire!’” (22:19-22). Scalding water melting bellies and skins . . . maces of iron striking . . . the punishment of hell surely and clearly is extreme pain for all eternity. If the point of pain as punishment wasn’t clear enough from the passages already quoted, the Qur’an makes the point again and again. Angels will strike the disbelievers faces (8:50), they will be dragged in boiling water with shackles around their necks and in chains and will be filled with fire (40:71-72). Curtains of fire will hem them in and “when they cry for relief, they will be relieved with water like molten brass, which scalds the faces. What a miserable drink, and what a terrible place” (18:29). The place called hell where the disbelievers will abide forever, enduring conscious existence is a place of intense continuous suffering. They will plead: “Our Lord, avert from us the punishment of Hell. Indeed, its punishment is ever adhering. Indeed, it is evil as a settlement and residence” (25:65-66)—but the plea is not heard. One question remains to be answered, one that traditionalists likewise seek an answer to: Even though the primary purpose of the fire of hell is to inflict pain, the lost are still in some sense being consumed by the fire. To quote the Qur’an: “Indeed, it is the Flame [of Hell], a remover of exteriors (nazzāʿatan lilshawā—literally “a remover of the skin of the head”)” (70:15-16). How then is the eternal conscious existence of the lost being sustained? We find the Bible completely silent on the matter, which would be surprising if it does teach eternal torment—but expected if it does not. The Qur’an, teaching eternal torment, has an answer: “Those who reject Our verses — We will drive them into a Fire. Every time their skins are roasted through We will replace them with other skins so they may taste the punishment. Indeed, Allah is ever Exalted in Might and Wise” (4:56). The answer is simple. In order to ensure both the continued conscious existence and punishment of the painful burning of the fire, Allah will continuously create new skins so that the lost can feel the pain of the intense burning for all eternity. As was the case with the first two statements the Qur’an affirms the third statement (pain is a central part of the punishment in Hell, consciously experienced for all eternity) and does so clearly. The qur’anic treatment of this statement goes to show that the Bible could have been clearer in affirming the third statement. The Qur’an provides the answer. Islam’s holy book shows how the biblical authors “could have made their belief any clearer” had they wanted to communicate that the fate of the lost is eternal torment. Let me be clear what I am not arguing. I am not arguing that eternal torment is false because it is taught by the Qur’an. That would be a logical fallacy. The Qur’an teaches several doctrines that I myself hold, including monotheism. Additionally, I am not arguing that the Bible should have used the exact language of the Qur’an to communicate eternal torment—I am not claiming that the qur’anic way is the only way to do just that. What I am arguing is that J. I. Packer’s and Dr. Zuber’s are simply wrong to assert that it is not possible to express the doctrine of eternal torment with greater clarity than what we see done in the Bible. This is demonstrated by comparing the biblical material to the Qur’an. This fact poses an urgent question to the traditionalist: Why didn’t the Bible express the doctrine of eternal torment with greater clarity if it was possible? In holding fast to the traditional doctrine the traditionalist is forced to acknowledge the awkward reality that the author of the Qur’an—who by the way denies the historicity of the crucifixion of Jesus Christ (4:157-159) and ascribes to Christianity the belief that Mary is a deity “besides Allah” (5:116), clearly misunderstanding the doctrine of the trinity it criticizes—is better at communicating the important doctrine of the fate of the lost than the inspired Word of God. Luckily, there is an alternative way of explaining the obvious difference in how well the Bible and the Qur’an seem to teach eternal torment: The Bible doesn’t actually teach the doctrine after all! In and of itself the Bible is more than capable to make that clear. However, we all come to the Bible with preconceived notions that we read into the text. Here the Qur’an can play an important role. In demonstrating how the doctrine of eternal torment is clearly taught it becomes clear that the Bible is teaching something completely different. Just like travelling to a foreign country makes us reflect and look at our own culture with new eyes, the Qur’an makes us see anew what the Bible says and—just as important in a case like this—does not say. Coming back to the Bible after “visiting” the Qur’an we see that the language of eternal torment simply is not found in the biblical material. The biblical authors were not inept communicators, compared to the Qur’an’s. They simply did not teach eternal torment.